The Department of Planning, Monitoring and Evaluation (DPME) is central to the process of integrating the SDGs and their targets into the priorities stated in the NDP. 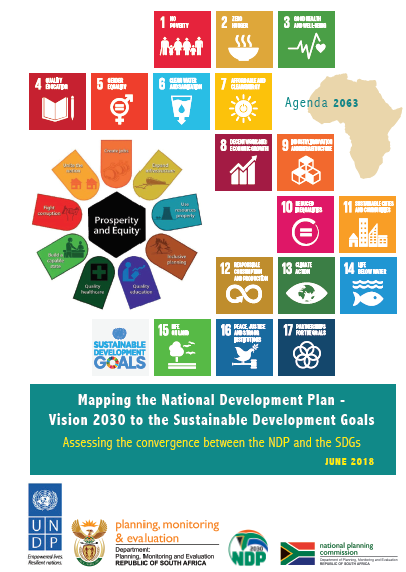 “Mapping the National Development Plan (Vision 2030) to the Sustainable Development Goals” is a detailed analysis of the convergence (and gaps) between the NDP and the SDGs. A further comparison is done to the African Union Agenda 2063. Where a gap exists, it examines how it is being addressed using other development strategies and activities. Through funding from ICLEI Africa, MCA was appointed to undertake a final edit of the document, undertake some updates and conclusively oversee the design and packaging for its launch. MCA’s familiarity with the NDP, SDGs and Agenda 2063, along with its editorial and packaging abilities underpins this work.